Click on the image on the left to see this animation and learn how to fold a SQUARE of paper into an origami house. Make it as big as you want depending on the size of the original paper. And decorate it like crazy! 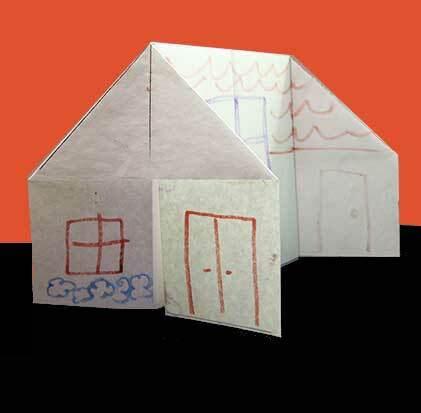 A simple gabled house can be a fun activity in a classroom, at a restaurant (use the paper placemats once you rip it into a square) or at home. This project is great for very young kids or older ones who want to make big towns of small houses, or big houses in small towns. Really, anyone can build one and that makes this a great easy project for kids, parents, teachers and anyone who dreams of being an architect. Send photos of your origami houses to us via email and we will post them on our site!